But you can follow Huddersfield's home tie with Manchester United over here. "It's a really good feeling, and a win that our application deserved. Credit to Coventry who made us work hard, but I think we'd had a good enough grasp to hang on even after their late goal." "Yes it was great to see him score, but getting 70-75 minutes was more important. He's looking fitter, and he's come into a good group, a competitive group, and its nice to think that he doesn't feel the pressure." Actually while we're at it, here are the full match highlights. Here it is, what we've all been waiting for. Another look at that brilliant West Brom goal. Totally meaningless in the end of course but a better one this weekend you will not see. "The lads put a right shift in, we really deserved to get something out of the game, but they showed us why they are Premier League. We have to be really proud, to have come here and do this against the quality of this club. "We deserved the goal after all the chances we made too. I don't really want to be big-headed, but I thought I deserved that goal. It was a long time coming as well to be honest." Their League Two promotion push has slightly faltered after losses to Colchester, Accrington Stanley and Forest Green Rovers in the league, but Coventry look capable of playing above the fourth tier. Jonson Clarke-Harris was impressive. Tom Bayliss shone. There were lots of positives, despite what was a fourth defeat in a row in all competitions. Full reaction from manager Mark Robins coming up. Colin Bundred: Great goal from Rondon. A much better striker than often given credit for. One of the big moments today: Salomon Rondo's goal. It was meaningless in the end, but honestly, you have to see it when the highlights come in. A bruising volley. Hamza Darby: What good did playing Barry & Evans do? Would have rather seen Field & Gabr given a chance, than these two that have done nothing all season. "It was a tough game. We said before then game we're going to have to be on it. We had to set the tempo. "We've been the underdog a few times and I think Coventry should be proud of themselves, they had a good go. "We'll now take it game by game and see how far we go in the FA Cup. We'll see who we get in the draw to tonight and see if we can get to Wembley." A debut goal for his record signing striker once he's finally fit to play and Brighton in the FA Cup quarter-finals for the first time since 1986. I'm not sure Chris Hughton suits a goatee if I'm honest. But he's a relaxed and happy man this afternoon. Full quotes from him to come too. 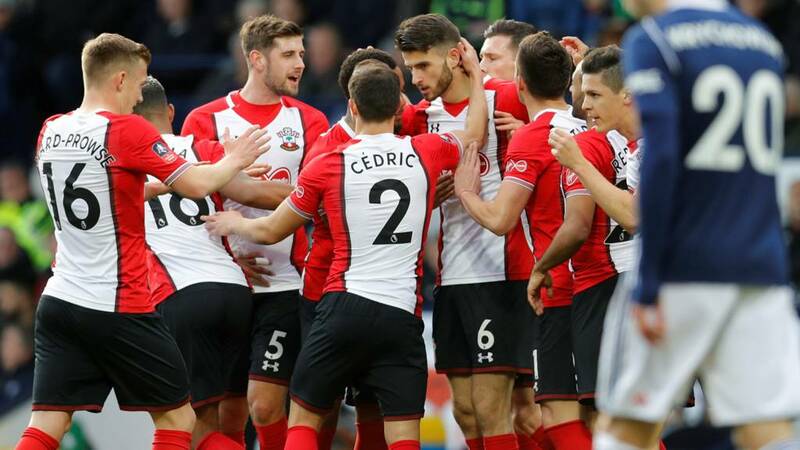 Southampton manager Mauricio Pellegrino, speaking to BBC Sport: "It was important for us for many reasons, we go to the next round in one game, and also because we wanted to give opportunities to players not playing too much. And we wanted to improve the spirit ahead of the next Premier League game. "They were really strong in direct play, and they are very good from set plays. It was a really tight game, we were really focussed today. Now the most important thing is to believe in our job and our way." The late kick-off, Huddersfield v Manchester United, is getting under way in about ten minutes. You can follow it all here, plus it's on BBC Radio 5 live. "We changed the captaincy to Gareth because that was the right thing to do. I have to get wins and I made a decision I thought was right." "It’s not a decision for me, but in terms of the character the team showed... and the fans, who were magnificent and showed loyalty. We have to show our loyalty this week and get a result in the league." West Brom manager Alan Pardew, speaking to BBC Sport: "I didn’t think we were great in the first half after a week of not what you would have really wished for, but we pushed Southampton in the second half. Then we get a great goal and there was a grandstand finish. But it defines our season, we know what to do now. "It’s been difficult but in terms of experience on the pitch and attitude and reaction, I was pleased. It was a difficult day for the players, we gave a good account of ourselves and we are slightly unfortunate." Southampton winger Dusan Tadic, speaking to BBC Sport: "It was an important win for us, we deserved it and we played good. We defended and attacked together, there are some things to improve but we are going in the right direction. "They are very physical and hard to play against especially in the last 15 minutes but we showed a lot of character. "Every goal is great because it’s a team goal, it was a nice finish but most important it was team work, you cannot do anything without team work." In the second half Coventry City have done Mark Robbins proud. Three clean strikes from Brighton has been enough. No yellow cards in the game today which gives you an indication that the Sky Blues didn't make Brighton's life as difficult as they could have done. That's it! Brighton head into the quarter-finals - no fairy tale for League Two Coventry today.